Over the past few months, we’ve launched successful, free integrations with messaging platforms Slack and HipChat. You might be wondering what the value is of integrating Lucidchart, a diagramming application, with these apps. It’s simple: they help us make visual collaboration and knowledge sharing easier for our users. 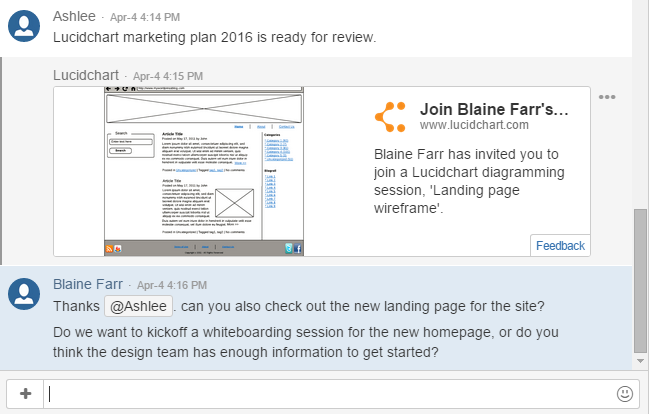 We want Lucidchart to work where our users work. HipChat and Slack are the latest in a string of our integrations (Confluence, JIRA, G Suite, Office 365 and Jive, just to name of few) that make Lucidchart diagrams easier to create, share and use. The value of these integrations can be seen with a large number of our team accounts quickly integrating with Slack or HipChat within the first months of the integration launches. Teaming up with these messaging platforms increases Lucidchart’s already collaborative cloud-based functionality in important ways. First, you can easily kickoff real-time group whiteboarding and collaboration, no matter where in the world your team members are located. Second, when you post a Lucidchart diagram to Slack or HipChat, team members can instantly see and comment from an app they’re already using. It makes it easy to reference visual documentation during group discussions. With our Slack integration, Lucidchart users are able to use the integration both in private group channels and in direct messages between users. This is particularly valuable if your team is using the private group feature. Just typing “/” in Slack opens up a list of available options that help users find the /lucidchart command to create new Lucidchart documents. It’s [title] hint also gives users a nice reminder to name their diagram. Lucidchart’s integration with HipChat’s Input action (the small button near the chat bar) makes it easier to use for those that are unfamiliar with the standard “/” slash command used in both Slack and HipChat. This feature also helps discoverability for users who aren’t aware that the Lucidchart add-on has been installed. Additionally, the Glance functionality allows you to pin important Lucidchart documents, like network diagrams, project documentation and support processes, in a team chat room for easy reference without leaving the chat. This can help make Lucidchart or other documents easier to reference without searching. One small drawback at the moment is that Lucidchart is not yet available for HipChat Server. This has been an issue for some customers, particularly larger enterprises that are using the Server version. We plan to make this available as soon as it is released by HipChat. Lucidchart itself works seamlessly with both HipChat and Slack, offering the core functionality as described above. While both messaging apps offer similar features to end users, they provide surprisingly different APIs to developers. By integrating with enterprise chat tools like HipChat and Slack, Lucidchart users can increase collaboration, sharing and productivity across their teams. Try out our HipChat and Slack integrations, and let us know what you think.